Unique smart gaurd print surface. ! 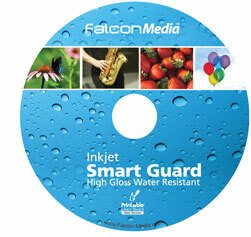 FalconMedia Smart Guard is a superior water resistant inkjet glossy surface for those looking for an ultra professional image. The Smart Guard layer offers a superb bright photographic finish, excellent ink absorption, and is resistant to smudges and bleed due to moisture and humidity. The Smart Guard layer yields exceptional print results with the major inkjet based publishing systems. FalconMedia Smart Guard media is an optimized professional media which meets the highest industry standards ensuring consistent quality, surface uniformity, flawless printing and handling on automated duplication systems. I purchased these to use in my Canon printer to design my own Cd labels. You get excellent results of the graphics printed on the cd. I would recommend these. Great product - exceptionally vivid results. Great product. Exceptionally vivid printing. Select the needed Check box and click buy of Falcon Media CDR SmartGuard White Inkjet.